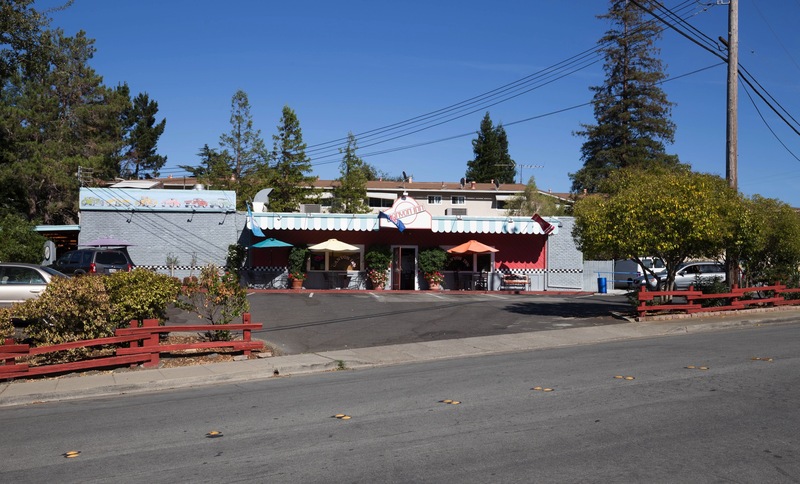 This week, I present the second in my series of blog posts focusing on specific Redwood City neighborhoods. Last time I took a look at Friendly Acres; this week I walked through a very different neighborhood in a very different part of the city: the Canyon neighborhood. The above map is, of course, two-dimensional, which omits one of the Canyon neighborhood’s essential elements: it is hilly (but not mountainous; I’ll save that word for the Farm Hill neighborhood!) and indeed contains a canyon or two. Canyon Road, in fact, runs right down the canyon that likely gives this neighborhood its name. Oak Knoll Drive (which becomes Hopkins Avenue) runs perpendicular to Canyon; walking the neighborhood on either of these streets involves a fair amount of up and down. 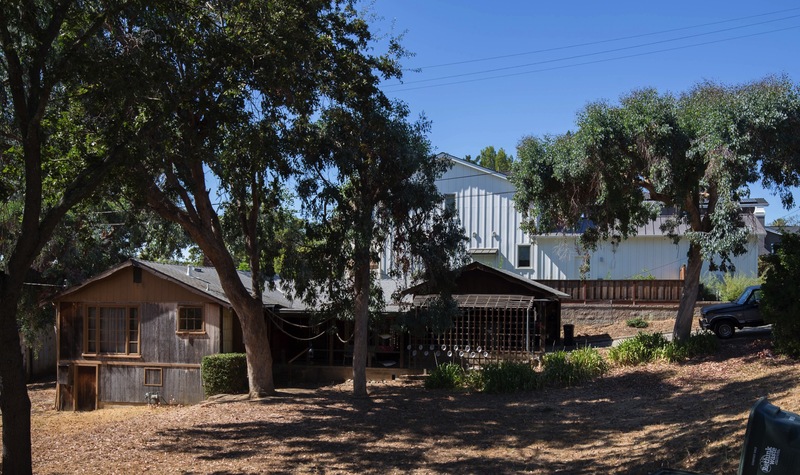 One interesting aspect of the neighborhood is the fact that there is a large section of unincorporated properties—properties which are part of San Mateo County but are not within the Redwood City limits—buried within it. Many of the properties along Hillcrest Drive are outside the city limits, for instance, as are those along significant portions of Oak Knoll Drive and Upland Road. But given that the unincorporated section is entirely surrounded by the properties that do lie within Redwood City, perhaps the city saw no point in excluding that section from the neighborhood association—and thus that particular unincorporated section is not shown on the neighborhood map. The following is a map I quickly put together (ignore the upper-right corner, and the fact that I didn’t get the part around Garrett Park correct). 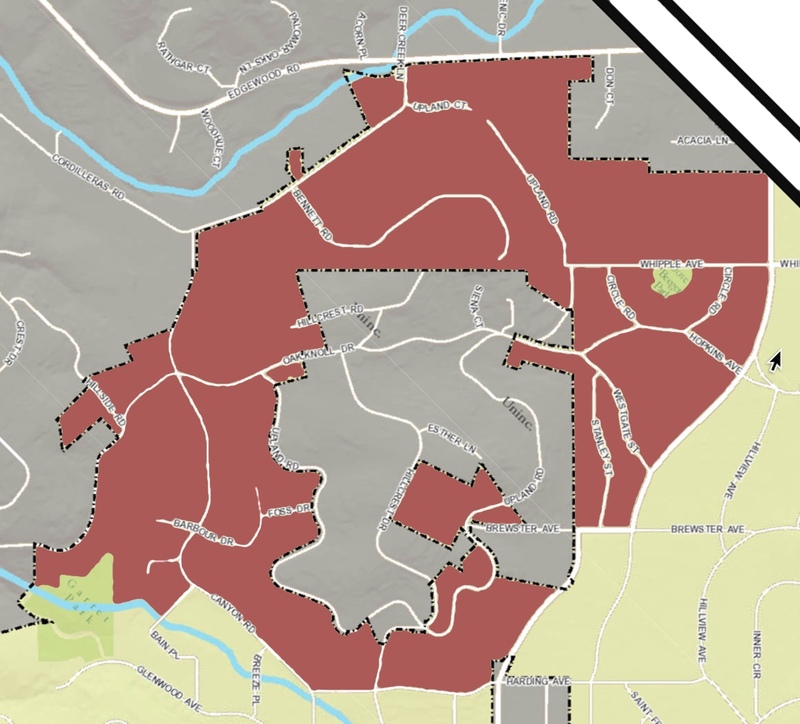 The thing to notice is the large grey section in the middle: it indicates unincorporated land that is nevertheless considered to be part of the Canyon neighborhood. The older house in the foreground was built in 1935, and is a two bedroom, one bath, 940 square-foot home that Zillow claims is worth $1.16 million. The white house looming in the background (which is of course right next door on Hillcrest) is newly built, having been constructed in 2015 (but not completed until earlier this year, I believe, based upon repeated visits to the property). It is a four bedroom, 3-1/2 bath, 3,317 square-foot home that Zillow claims is worth $3.132 million. Years ago there were a lot more older homes like the former in the Canyon neighborhood, but these days they are few and far between. 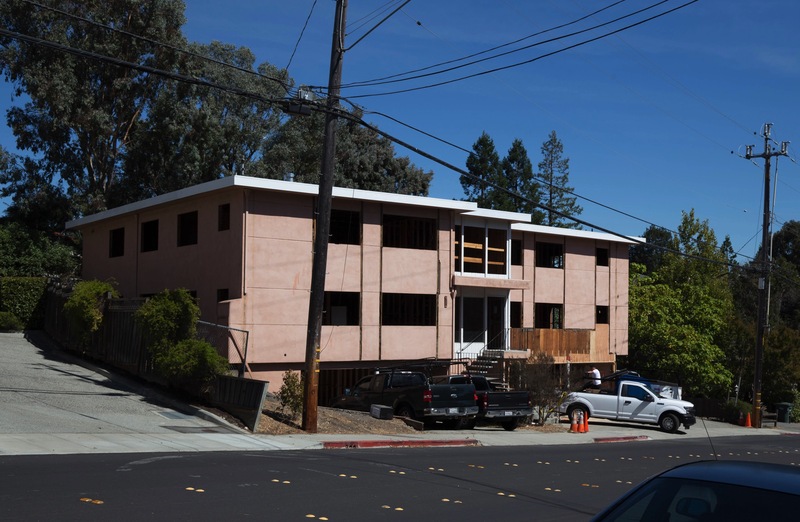 The last several years have been boom years for the construction industry in this area (as in much of the Bay Area), and many older homes have been either drastically remodeled or, as is the case with the newer house in the above picture, completely torn down and replaced. Very few of the really old homes appear to remain in this particular neighborhood. Walking through the neighborhood I could hear hammering noises echoing up and down the canyon: there are a fair number of remodels, and new homes being built there, even today. Many months ago I noticed that this small apartment building at 615 Canyon Road appeared vacant, so since then I’ve been paying attention to it every time I am in the area. It sat empty and apparently idle for quite a while, but recently a construction crew moved in. Demolition appears to be complete, and now workers are actively shoring up the building and framing up new walls. I know nothing about the project except what I’ve been able to observe from the sidewalk, but I’m guessing that the building is being upgraded and that the rents, once the building is back online, will be higher (possibly much higher) than they were prior to construction. Getting away from housing, the neighborhood also has the afore-mentioned Emerald Hills Shopping Center, plus two parks (technically, one and a half), a gas station, the Canyon Inn restaurant, two churches, and, of course, Sequoia Hospital. The shopping center is on the small side, but after its recent remodel (before which the market space sat empty for quite some time) it now boasts five restaurants (Speederia Pizza, Emerald Hills Cafe & Roastery, Sancho’s Taqueria, Hillside, and Kaigan Sushi), a dry cleaners, two salons, a fitness center, an insurance agent’s office, and Bonfare Market. This market, which is about half the size of the one that once dominated the center, is tightly packed. It has basic items such as milk and eggs, soaps and soups and cereals, and some produce, but also has a relatively large liquor department and a lot of items that seem to be aimed at schoolchildren: candy, sodas, and pre-packaged baked goods. There is also a small deli, and a couple of tables outside where you can consume your purchases if you so desire. It’s more than a 7-11, but much less than, say, Safeway. The parking lot, which serves the entire center, is small, but then again this regional center likely gets a lot of walk-in trade. As for parks, the neighborhood has two: Dove Beeger Park, on Whipple Avenue across from Sequoia Hospital, and Garrett Park, on Glenwood Avenue. Both are named for individuals who were important to Redwood City’s history. Dove Beeger graduated from UC in 1915 with a degree in bacteriology. Subsequently she worked as a lab technician at St Francis Hospital in San Francisco and Mills Memorial Hospital in San Mateo. In the late 1930s she helped start the movement that led to the founding of the Sequoia District Hospital in Redwood City. Because of this she was named “Outstanding Citizen of the Year” in 1946. Dove not only was a member of the hospital’s Founder’s Committee, she also served on the hospital Board of Directors from 1951 until her death in 1964. The park that bears her name originally was a vacant lot across the street from Sequoia Hospital. Four families donated a part of their lots to make the park space more uniform, after which the park was completed and dedicated in 1963. Today this small, quiet, one-acre park has a playground with modern play equipment, some picnic tables, and a nice grass area (no restrooms, though). George L. Garrett Jr. was a police sergeant who, in 1981, responded to a robbery at the Bank of America (which back then was located at the corner of California and Winklebeck Streets, where the AutoZone is today). The suspect, who was seated with the branch manager, pulled out a gun when confronted by Garrett. Garrett moved quickly to push the bank manager out of the line of fire, and was fatally shot for his efforts. 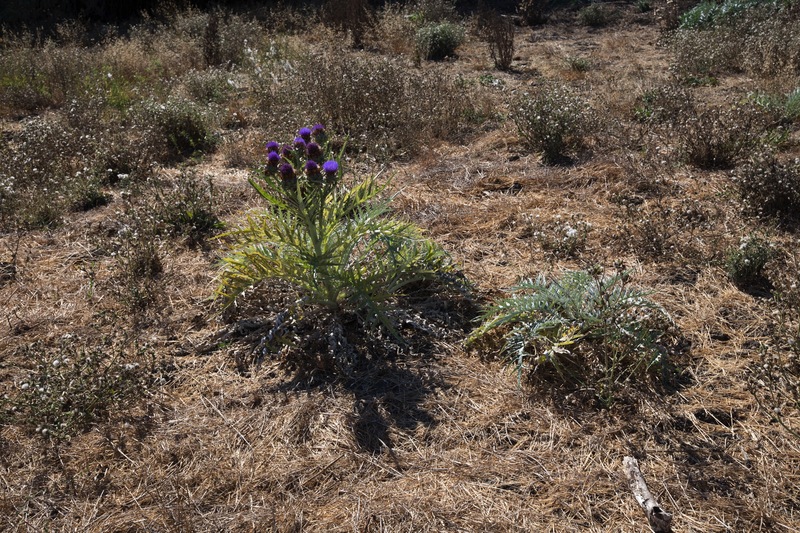 Upon closer examination and some research by my wife, however, the plants appear to be a Cynara Carduncul—an artichoke thistle. They’re pretty invasive and reproduce by seed, so they’re likely in the park naturally. About the park, though. Curiously, it appears that this park straddles two neighborhoods: the developed portion appears to be almost entirely in the adjacent Farm Hill neighborhood, while the undeveloped part seems to lie within the Canyon neighborhood. Extending alongside both is the Hetch Hetchy right-of-way. This section of the right-of-way is one that you can actually walk on; you can follow it right up to the back side of the Emerald Hills Shopping Center, where you’ll find your way blocked by a fence. Incidentally, keen-eyed observers may have noticed some parallel lines running from near the lower right corner of the city’s neighborhood map to near the upper left, as well as the other set that zig-zags its way up from the bottom of the map (towards the left), alongside Garrett Park, and on up towards the top. These mark the path of two Hetch Hetchy pipelines that cut through the neighborhood. The land above the buried pipelines cannot be built upon, so when exploring the area you’ll notice the long, straight sections of undeveloped land that mark the pipe’s path. Some of these sections are open to the public, while others are completely fenced off, seemingly with no rhyme or reason. Given that they would make excellent walking trails, the fact that some parts are closed is a real shame. I mentioned that the Canyon neighborhood contains two churches. Both are near to each other, along Cordilleras Road. St. Matthias Catholic Church (and preschool) is located at the corner of Canyon Road and Cordilleras, while Church of Jesus Christ of Latter Day Saints can be found on the corner of Edgewood Road and Cordilleras. The new hospital has some nice gardens and outdoor seating areas, and overall it is a very nice facility. 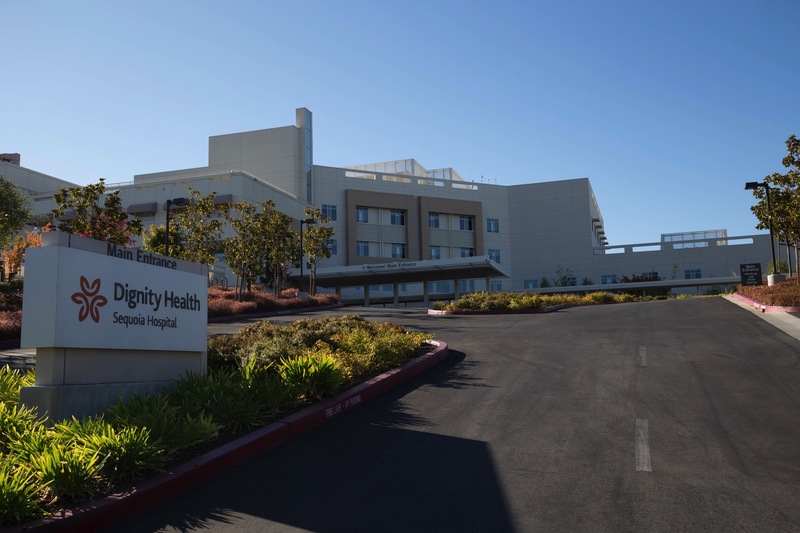 The main entrance is somewhat forgettable, but a hospital should put function above form, and Sequoia does that in spades: Sequoia has been recognized nationally as one of America’s top 100 hospitals for cardiac care, its Birth Center is a favorite among Peninsula families, and it is well-regarded both for its Center for Total Joint Replacement and for its comprehensive emergency care. I can personally attest to two of those: my youngest son was born at Sequoia Hospital, and my family has taken advantage of the emergency room facilities on more than one occasion. The Canyon neighborhood is a delightful place in which to walk. Its hills provide a great cardiovascular workout, and if you enjoy looking at houses there is a lot to attract your attention. For the most part the neighborhood’s streets are fairly quiet, and except for in the unincorporated parts (I’m looking at you, Oak Knoll Drive) there are plenty of sidewalks. Emerald Hills Shopping Center is a great place to get a coffee or a snack, and the neighborhood’s parks are nice places to take a rest. 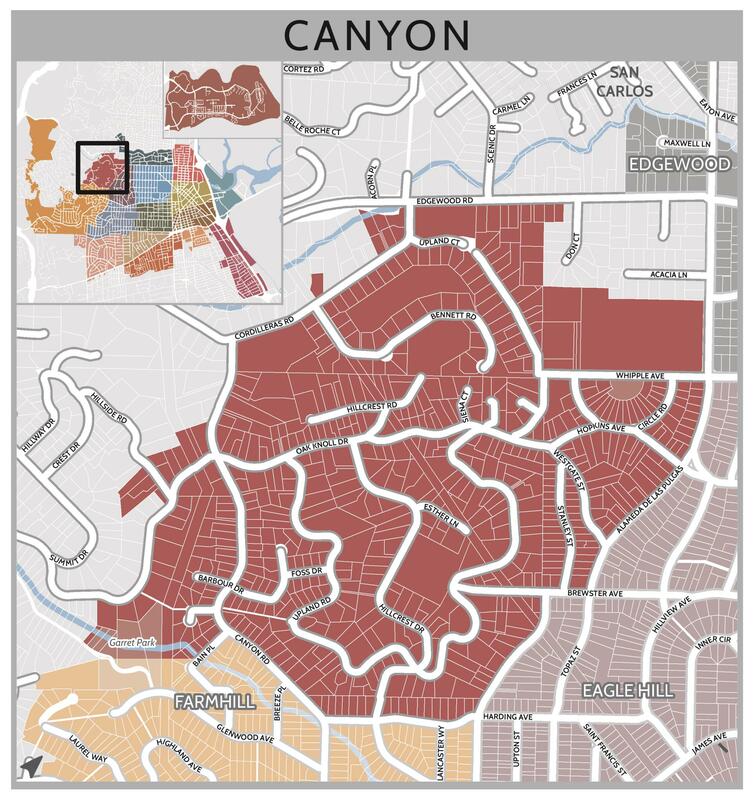 Based on all that it offers, the Canyon neighborhood must be a really great place to live. Thanks Greg for your post on the Canyon neighborhood. We moved here 10 years ago and I’ve been walking the flats and hills here ever since. You can start on the flats and go all the way up and into Edgewood Park. So you get an urban and wooded/park experience all in one. And even though I have walked the area many times I often see something new! I love living here. Thank you for the very thorough posting. I learned a lot about the neighborhood that I have lived in for over 17 years. I didn’t even know it had a name. I look forward to exploring the lesser knows areas that you mentioned, including the gardens at Sequoia Hospital. I love the combined quiet of the neighborhood and being able to walk to restaurants and coffee and all the close by conveniences. I like being able to decide if I want to take a flat walk (Canyon Inn to Cordilleras to Edgewood) or a hilly walk (via Oak Knoll). The views from Upland are spectacular. It is a great neighborhood to live in. I do love the views from the hills; I often walk in the Canyon neighborhood and usually press on into Emerald Hills, where the views get really spectacular. I live near Alameda de Las Pulgas and I, too, love how I can choose either a flat walk, a somewhat hilly one, or a really hilly one (on occasion I walk all the way to the Easter Cross; it’s great exercise!). Although I don’t live in the Canyon neighborhood, I can really appreciate what it must be like to live there. Hi – Tina and I are starting a Neighborhood Association for the Canyon area, would you be interested in an update? I would indeed! Thanks for thinking of me. Thank you on your update on the Canyon Part of Redwood City. This is my old Stomping grounds. I attended Sequoia High but had more friends from San Carlos High. Good and not so good experiences here in the 60’s and 70’s Too much teenage drama but will never forget this area and the special people who lived nearby. I think “drama” is just another word for “High School”; we certainly had plenty where I grew up! And I know that my boys, both of whom went to Sequoia High, had their share. But there are some great people in all parts of Redwood City; I’m enjoying getting to know them and their neighborhoods. Thanks for the comment! Wonderful article about our little neighborhood. Anencephaly you might notice a lemon orchard if you walk along Upland Road. I’ll watch for it! Thanks for the heads-up! Thank you! I look forward to doing some research on that neighborhood (and others). I’ve walked through them all, but its fun to concentrate on one and try and capture something of the essence of the neighborhood. Learning more about the history (which I’ll then impart in the relevant post) will help with that essence, and should make the post more interesting (if there is any interesting history about which to write, that is…). Thanks for reading! Hi Greg, thanks again for an interesting look at a neighborhood I usually just drive through! I have often thought it would be cool to do a Hetch-Hetchy hike through the city… wouldn’t it be nice if it was opened up once a quarter for such a purpose, like Canada road opens every month for bicycles? Oh, and as a Stanford employee, I must insert that the phyicians in the Sequoia birthing center are Stanford doctors, so you know they’re good!